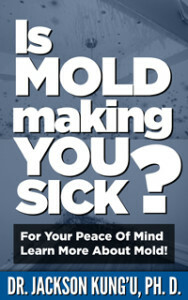 Is mold in your house making you sick? This kind of a question would arise if someone suffers from persistent symptoms such as sneezing, runny noses, red eyes and skin rashes that seem to lessen or disappear when the person is not at home. The situation maybe complicated by the fact that only one member in the family would be experiencing these symptoms. Observations suggest that about 20% of the human population can have allergic reactions to mold spores. For asthma sufferers who are very young, elderly or those with weak immune system, mold spores can trigger much more serious problems. mold spores are everywhere. They’re in your house, in your attic, on the street, in your living room, in your kitchen. It’s a question really of how much mold is in your house and what types. Some mold spores are worse than others. The obvious sign of mold in your house is the visible mold growth on surfaces. This may appear as fuzzy or hairy growth when the mold is actively growing or powdery when the mold is inactive. The mold comes in different colors such as black, grey, blue, green, white or a shade of these colors. There are also indirect visual signs that suggest your home could be infested by mold. These include signs of water damage such as discoloration, peeling or bubbling paint, and bulging walls or ceilings. A musty or earthy smell is another reliable indicator of mold growth. The best way to confirm if you are exposed to excessive amounts of airborne mold spores is to test the air in your house or office. To test the air for mold, you could either use a do-it-yourself mold test kit or you could hire a professional to do it for you. Sick Building Syndrome (SBS) is a term used to describe situations in which building occupants experience acute health symptoms that appear to be linked to the time spent in a building with no specific cause that can be identified. The complaints may be localized in a particular room or zone, or may be widespread throughout the building. SBS related complaints have increased in recent years and result when a building is operated or maintained in a manner that is inconsistent with its original design or prescribed operating procedures. Sometimes indoor air problems are a result of poor building design or occupant activities. Occupants of sick building syndrome buildings complain of symptoms associated with acute discomfort, e.g., headache, eye, nose, or throat irritation, dry cough, dry or itchy skin, dizziness and nausea, difficulty in concentrating, fatigue and sensitivity to odors. The cause of the symptoms is not known. Most of the complainants report relief soon after leaving the building. Many factors contribute to the sick building syndrome and sometimes it is difficult to pinpoint the cause. Inadequate ventilation: This implies insufficient outside air, insufficient airflow and inadequate circulation. An improper system design or operation, and occupant tampering with HVAC system may be the cause. Chemical contaminants from indoor sources: Copying and printing machines, computers, carpets, furnishings, cleaning materials, smoke, paints, adhesives, caulking, perfumes, hairsprays, solvents emit VOCs or volatile organic compounds that affect indoor air quality. Chemical contaminants from outdoor sources: Pollutants from motor vehicle exhausts; plumbing vents, and building exhausts (e.g., bathrooms and kitchens) can enter the building through poorly located air intake vents, windows, and other openings or a nearby garage. Biological contaminants: Bacteria, molds, pollen and viruses are types of biological contaminants. These contaminants may breed in humid and damp conditions, stagnant water that has accumulated in ducts, humidifiers and drain pans, or where water has collected on ceiling tiles, carpeting, or insulation. Sometimes insects or bird droppings can be a source of biological contaminants. Physical symptoms related to biological contamination include cough, chest tightness, fever, chills, muscle aches, and allergic responses such as mucous membrane irritation and upper respiratory congestion. Primary assessment confirms presence and further tests reveal the identity of moulds. This could help draw conclusions on factors that contribute to sick building syndrome. Based on all information and evidence gathered, a strategic solution may be developed. Pollution source removal and air cleaning would be the basic approach. Proper ventilation rates and air distribution can help minimise SBS. Effective communication between building occupants, management and maintenance personnel can help find the causes and consequences of sick building syndrome. Awareness about indoor air quality issues can aid in overcoming the sick building syndrome. Caused by or relating to an allergy or having an allergy to (a substance).